In March 2011, after Japan was rocked by a devastating earthquake out of the blue, thousands of charity organisations sprang into action to help raise some emergency relief funds. 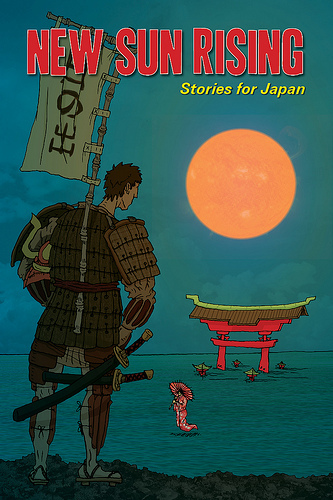 Many artists and writers across the world wanted to do their bit, too… and they achieved this by feverishly putting together various Japan-themed books and anthologies, all proceeds from which would go towards the massive aid effort. One of these anthologies is called New Sun Rising, a book of original writing and artwork that celebrates the people and culture from The Land of the Rising Sun. It’s not available yet, but it soon will be: so keep one eye on their official blog, if you’re interested. A haiku sits on three lines, with a 5-7-5 syllable structure. A haiku contains a ‘seasonal’ word (evocative of spring, summer, autumn or winter). A haiku contains a ‘cutting’ word (a sudden shift in the line of thought). A haiku avoids rhyme and metaphor.